Introducing Arapaho Glacier. Arapaho Glacier is one of the southernmost glaciers in North America, and sits square at the head of the Silver Lake drainage basin. It's part of something called the Boulder Watershed, which is, as the name might imply, a provider of water to the city of Boulder. It is strictly off-limits to anybody…well, at least the general public. The area is patrolled by volunteers all summer long. It also hosts a few families – caretakers if you will. They work in the area, but they also are allowed to fish and hunt the land…sort of a private resort on public land if you will. I don't have any problem with land off-limts to humans…I think it's necessary, as we have a massive impact on everything we touch. That said, this is undoubtably the best summer ski line in Boulder. It's long, the pitch is consistent, and it's clearly gorgeous. What can I say – it would be a nice ski…a really nice ski. The Watershed is an interesting concept. I'm all for clean water, but Boulder gets its water from many, many drainages, the majority of which allow humans. If the city were getting all its water from one pristine source, that would be one thing, but it's not. It all mixes together – "pristine" and not-so-pristine. And it's not like the city is drinking the water straight from the glacier. It's all treated first with chlorine and other chemicals. It's a strange law that dates back to the 1940's when times were different and water treatment much less refined. It's one of those things that just is, and it's rarely questioned. I honestly don't think a handful or even a bunch of summer skiers would effect Boulder's water quality in any way, but alas a rule is a rule and breaking this one will land you a $500 fine if caught. That's an expensive ski run. Who knows? Perhaps the closure of the watershed – which also is home to some of the most beautiful peaks in the county – will end in my lifetime. I've heard of old archaic mining laws from the 1800's coming off the books because they don't make any sense anymore…perhaps the same will be true for the Boulder Watershe and Arapaho Glacier. If that happens, you can be sure Elaine and I will be some of the first to drop in. 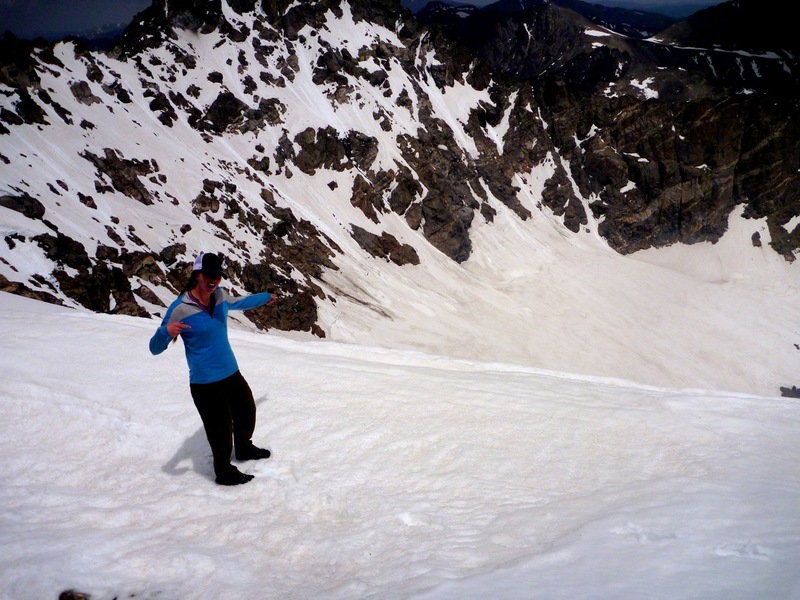 Elaine on the top of the forbidden run – Arapaho Glacier.